As an IT and management consultant, Barry has advised and guided clients in a wide range of industries in their business intelligence (BI) and data warehousing projects over the past twenty years, from strategy and implementation to assessment and migration. Clients include government agencies, major banks, insurance companies and retailers throughout Europe, Africa, Australia and the US. Barry offers particular skills in the initiation and oversight of major information-led projects, from traditional BI to today’s big data, catalyzing and driving significant human and organizational change. Equally at home in business and IT organizations, Barry supports the creation of conceptual and logical architectures and defines the project and program approaches necessary for success. Barry applies his long experience and extensive knowledge to assess your existing informational systems and recommend how to improve them. Working with you business and IT teams, his authoritative yet conciliatory approach allows the teams to explore past shortcomings and define sought-after new outcomes. Having worked in a major software developer for more than twenty years, Barry has intimate knowledge of all aspects of the business from design and development to product management to marketing. Bridging the divide between technical features and business uses, he delivers materials that uniquely positions the strengths and uses of information-related software products. Barry engages your readers, whether business or senior IT, with an easy yet clear style of writing that simplifies complex concepts and provokes thoughtful consideration of options. Applying his knowledge and experience, he provides balanced opinions on your strategies and products that can inform realistic customer expectations. Barry offers white papers and articles of various styles and lengths through both your and his channels. He blogs personally or can contribute to your blogs, either in his own name or anonymously. As an experienced presented and educator, Barry is the ideal person to keynote conferences and launch events. He has a long history of delivering highly valued webinars, both for internal training and external marketing. Barry was among the earliest international speakers on data warehousing as far back as the mid-19990s, speaking at early TDWI conferences and major IBM events. His passionate yet engaging and friendly style is widely appreciated by audiences worldwide. As one of the longest-serving authorities on the business use of information, spanning for data warehousing to big data, Barry offers keynotes spanning the lessons of the past to the visions of the future. As an independent speaker, he provides the balance and contrast to vendor-sponsored speakers. His product-agnostic track sessions offer clarity in functional uses of technology in business. From half-day workshops to full three-day sessions, Barry provides foundational education to senior IT staff and technology-savvy business people in the overarching concepts, approaches and architectures needed to master information-enabled business today. His book, “Business unIntelligence” is the basis for much of the educational workshops he runs. Barry also offers vendor-neutral webinars of an educational nature, such as those offered by the Association of Computing Machinery (ACM) and BrightTalk and available on the Resources page. If historians were fair and accurate, the names ‘Devlin and Murphy’ would be peers to Vannevar Bush, Ted Codd, and Chris Date. Barry’s early data warehouse architecture fueled a $140B industry for the last 30 years. Yet Barry is that rare individual who keeps inventing new technical insights year after year. Listen, then listen again when he speaks. This humble man with a great sense of humor is always amazing me and making me try harder. Barry has assisted our organisation in reviewing, assessing and describing a significant shift in the way the Department of Immigration and Border Protection portfolio uses information to support decision making. The portfolio has a significant investment program agreed and Barry has helped us structure our thoughts to a desired future architecture including the governance approach to being successful. Barry delivered the opening keynote of the Gurus Of BI (GOBI) 2014 conference, Norway’s largest BI & Analytics conference. 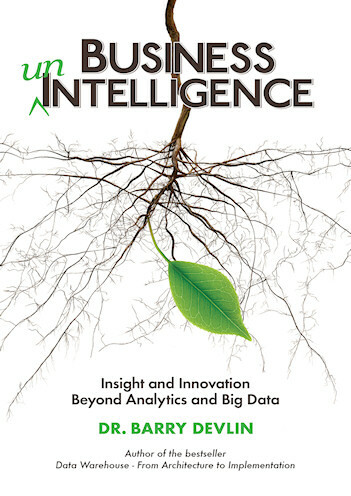 Drawing on his book “Business unIntelligence”, Barry presented a novel architecture, combining the strengths of traditional business intelligence with the opportunities of analytics, big data and the internet of things. As one of the founders of data warehousing, his emphasis on the people aspect should be noted by everyone hoping to succeed with BI and data warehousing. Barry continued to inspire in a full day post-conference seminar, making all attendees question their current DW architecture. Thought-provoking stuff! Barry brings to his projects the rare combination of (1) staggering technical depth, (2) great listening skills, and (3) the ability to envision a future and articulate it in meaningful terms to regular folks. It’s rare to find someone so well versed in how things are done today who is also completely unwedded to the status quo. Barry is that guy. If you want to think big about how to create competitive advantage, while ensuring that the plan still maps practically from a starting point of the way people and tech actually work — Barry is invaluable. Barry is one of the finest minds in our business. His dedication to and understanding of all things BI is unsurpassed. I am constantly in awe of his insight and originality. Barry, an IBM Distinguished Engineer at the time, was extremely generous with his knowledge and expertise which he was happy to share with all his colleagues. He showed in depth customer insight and an astute understanding of the application of technology in improving overall business operations. This insight proved invaluable to myself and my organization at a critical time in our development.